Robert Campbell, architectural critic for The Boston Globe, raised the following relevant questions when our Chestnut Hill Waterworks project opened in 2008. “Why was the architecture so lavish? Should we worry, perhaps, that corruption was at work? Did officials receive kickbacks in return for spending too much public money on the buildings and their builders? This was, after all, the age of notorious political bosses in American cities, including Boston. Boston benefits from many examples of high-quality infrastructure and public realm projects completed a century ago that are either still in use or robust enough to be repurposed with a new life. 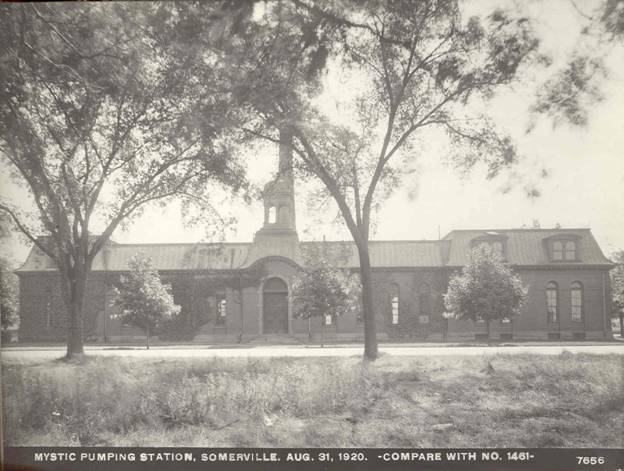 The Mystic Waterworks Pumping Station in Somerville was such a candidate for re-use due to its in-town location and proximity to the Somerville Housing Authority’s Capen Court Senior Housing complex. To address its own population growth, Charlestown had constructed the Mystic Pumping Station in 1864 to boost its water supply from the Mystic Lake. When first built, it housed two steam-powered engines with a combined capability of moving 13 million gallons of water per day. 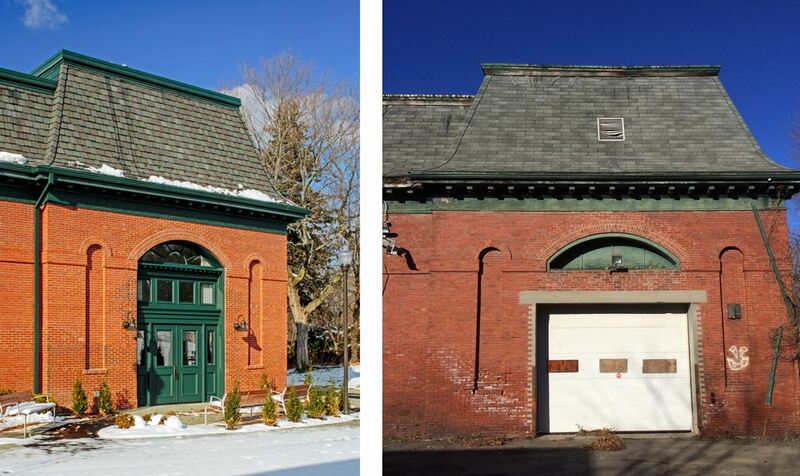 Additions were built to provide space for additional pumps as the system was expanded to include Everett in 1870, just prior to Boston’s annexing of Charlestown. It was expanded again in 1895, just as Boston’s Metropolitan Park District was constructing the Mystic Valley Parkway, designed by the Olmstead Brothers as part of a number of aesthetically pleasing pleasure roads in and around the city. The building continued to pump water for the city until 1912 when it was decommissioned and the pumps and engines were sold as scrap metal. During the First World War, the interior was divided up into offices for research, and also incorporated new mezzanine and attic levels. Another subsequent renovation in 1921 further moved the building from its original use and its original layout of a singular large open space. 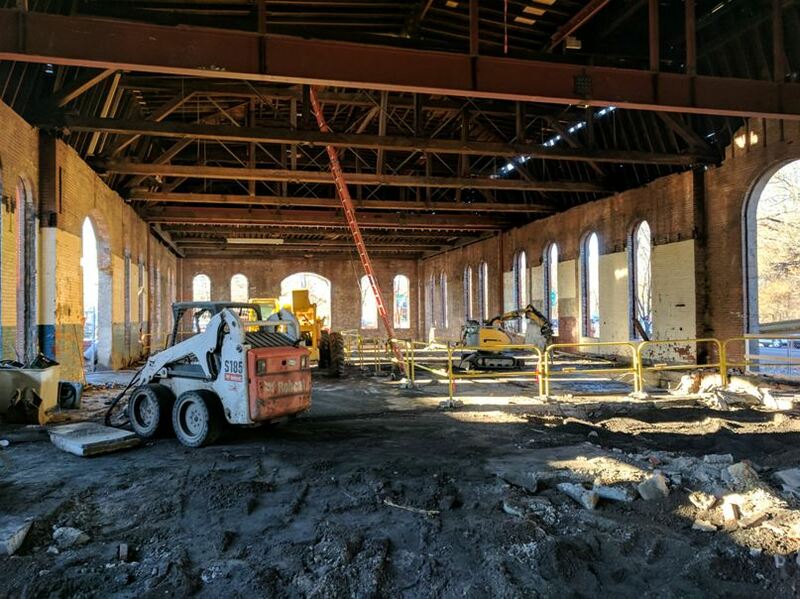 “The redevelopment of Mystic Water Works presents an extraordinary opportunity to provide 25 units of affordable housing for very low-income elders while restoring a highly visible dilapidated historic building to its former beauty and also completing the Capen Court housing project,” wrote the Somerville Housing Authority in its application for CPA funds for the project. This sums up the logic behind the proposed redevelopment and suggests a process for tackling other infrastructure assets that are no longer in use, but well-located. Our involvement began in 2011 when we were awarded the commission to convert this historic building into senior housing, combining two areas of our expertise­­ — senior living facilities and adaptive re-use. The building had been neglected over the years and we found it in rough shape. 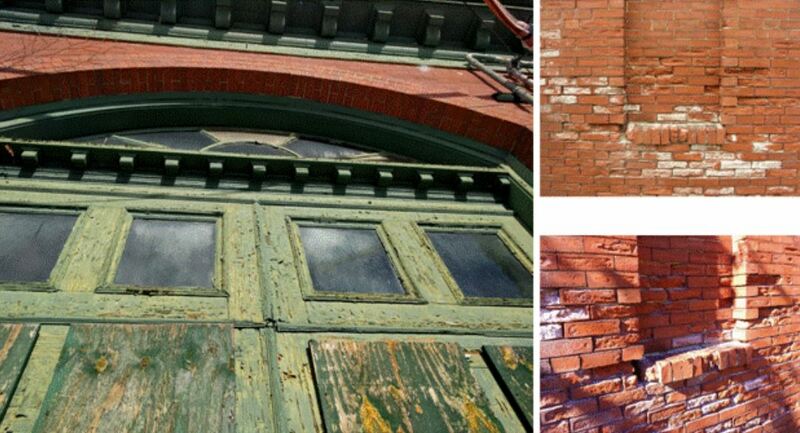 The exterior brick was deteriorating in many areas and needed repair and re-pointing, the original wood windows and doors were falling apart, a new roof was in order and many interior additions needed to be demolished and removed delicately without damaging the main shell of the building. Our historical consultants, MacRostie Historic Advisors (MHA) found that little documentation of the building existed beyond some old photographs, and a large part of our detailed design was based on field research and discovery. As in many historic buildings with cumulative adaptations, there existed many fragments of what had been there originally. Using the old photographs and our knowledge of period construction, we were able to recreate many of the historic details. Jonathan Kresch in our office did a lot of field measuring and sketching to capture the details for the various moldings, doors, transoms, and windows. He produced beautiful CAD drawings that allowed the millworkers to faithfully recreate these elements. 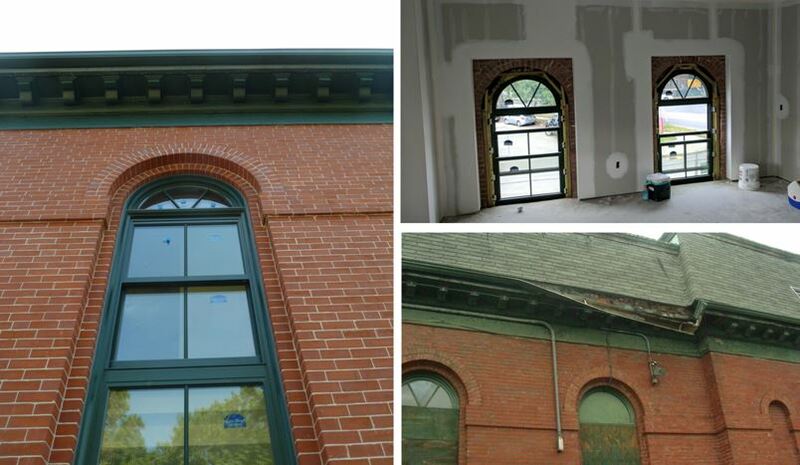 Windows are often a challenge in historic buildings and it was no different in this case. Aesthetics, early construction methods, and glass type all clash with desires for increased weather tightness, energy efficiency, current fabrication methods, and cost. As with most affordable housing projects, the funding sources are many and often come with requirements like those associated with historic tax credits. Working with MHA as our historic advisor, we needed to comply with The Secretary of Interior’s Standards for the treatment of historic structures to maintain the viability of these tax credits to help finance the project. Key to the financial viability of the project was to fit two levels of units into the high bay space of the pumping station and this had implications for the meeting rail of the existing windows, which is where we determined the floor should interface with the windows. This was suggested by how the mezzanine floor had been inserted early in the 20th century just below the arch top sash. Balancing the window profile and site lines with floor to floor acoustic requirements, we proposed our solution to the reviewers from the Massachusetts Historical Commission (MHC) and the National Park Service (NPS) and were rejected. Benefitting from MHA’s experience with the reviewing agencies, we immediately filed an appeal, re-designed the floor to mullion connection, and flew down to Washington, D.C. to make our case. It should be noted that you only get one appeal. If rejected, you cannot take advantage of the historical tax credits, which would have put the financing of this project in jeopardy. The team pleaded our case and as luck would have it, our reviewer was familiar with the building since his daughter attended Tufts University and he had driven past the dilapidated structure countless times. He understood the importance to re-use and rehabilitate the building as well as the need for affordable senior housing. He approved the redesigned window details so that the project could move forward. With a footprint of approximately 12,500 SF and a clear interior height of 19 feet to the underside of the heavy timber trusses, inserting a floor would seem like a simple undertaking. However, the conversion of any historic structure into a new use is always difficult, especially a residential one for a demographic with many specific needs. With a 150 year-old foundation, a hand-sawn truss system, and an open volume with a later interior loft addition, it was critical to assess the impact of the planned demolition and interior build-out. The plan had to reduce reliance on the existing structure, but also to improve its integrity. Selective and timed demolition was implemented to reduce failures and allow for real-time assessment. Early explorations made it clear that the use of the basement would be practically impossible; the constant presence of water made it a challenge, as there was a river running under the building in addition to the one running next to the building. It was determined that the basement must be filled, the foundations re-designed and those program elements re-assigned to the upper floors. The removal of interior walls that had provided bracing required tying the existing trusses to the walls to increase seismic resistance to meet current codes. Left: Basement prepared for backfill. Seniors occupied the 25 new residential units in November 2017, bringing to a close seven years of assembling complex financing packages, waiting for the allocation of tax credits, and navigating many design, construction, and cost challenges. Five of the units were reserved for formerly homeless seniors with the balance being affordable while an iconic neighborhood structure was restored to its former exterior appearance. Our world is a more beautiful place when more people enjoy the stability of a home and we are able to extend the life and presence of our historic buildings. Its proximity to the existing Capen Court senior housing augments the building’s efficiency in terms staffing and servicing and access to bus lines, allowing residents to engage the larger community. Our world is more functional when we repurpose conveniently located buildings in urban centers for new uses rather than building on open space. Rehabilitation and reuse are inherently sustainable using the embodied energy of the existing structure and upgrades to its insulation and mechanical equipment keeps utilities affordable. This project delivers on our mission to help our clients make the world more beautiful, functional, and sustainable and also provides a model for putting “infrastructure back to work” that suggests ways for renewing well-located historic buildings across the Commonwealth and beyond. Ed, I remember when this project started but did not realize that it finally got completed, and completed so nicely. I enjoyed reading about the history of the water pumping system of the past and the successful process of convincing the historical review agencies to ultimately approval the project. Congrats to the project team. What a beautiful example of adaptive reuse. Well done. I drive by here and walk on my way to and from work every day. When I first saw renovating activity I gasped and said to myself that I hoped the building was being re-purposed instead of demolished. I was so happy to see this building being restored and reused for such a good cause. Thank you for helping preserve such beautiful resilient structures!